I am also a textile artist who works with professional grade dye. They are very fine powders that are easily airborne. 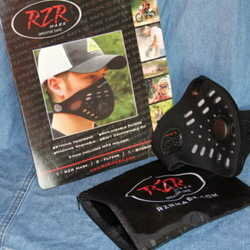 The RZR Mask was comfortable to use and I could mix my dye in safety. My husband uses power tools to sand the finish off of various materials and he found it comfortable and efficient as well. For ATV enthusiasts, this is a perfect companion to take along on dusty trails. It is machine washable and the filters are replaceable. The ergonomic design makes for a comfortable fit that didn't block vision or range of motion. For winter time use, it helps warm the air you breathe in, which is important for folks with respiratory issues. I highly recommend this product for anyone who is concerned about breathing in unwanted airborne material.